Sign up and we’ll let you know about future UrthBox offers. 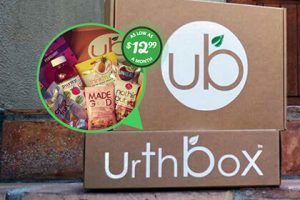 UrthBox helps you make your health a priority every month with its amazing healthy foods, beverages, snacks, and a lot more. Every product sent to subscribers has to meet strict sourcing, ingredient, nutrition, calorie, and manufacturing standards. So, whether you opt for classic, vegan, diet or gluten-free meal plans, UrthhBox has you covered.